Joys and Sorrows (iv) Love! Juozas Gruodis (1884�1948) was one of the most eminent and original Lithuanian composers of the first half of the 20th century. His emergence into the musical life of the time was as a promoter of progressive artistic ideas and as such was determined to raise the level of the budding Lithuanian professional music scene to European standards. Gruodis�s musical career spanned almost five decades from the years prior to the declaration of Lithuania�s independence in 1918 to the beginning of the Second Soviet Occupation in 1944. His creative work as a composer began rather late in life due to disadvantaged personal circumstances and frail health. He nevertheless managed to achieve prominence in diverse musical fields. Gruodis became the first professor of composition in Lithuania and thus laid the foundations for the national school of composers. He was the founder and director of the first conservatoire in the country and was also active as a conductor. Texture and timbre in Gruodis�s works were of secondary importance, for him the primary concern was melodic and harmonic invention. Hence it is not surprising that quite a few of his works were written for more than one combination of instruments and can be easily transcribed or arranged for different combinations. Christopher Horner was born in London and studied violin at the ILEA Centre for Young Musicians, the Royal Academy of Music, Surrey University, and as a postgraduate in Barcelona. His principal teachers were Henry Rubin and Eva Graubin. Christopher was invited to teach at the Royal Welsh College of Music & Drama in 1999, becoming Deputy Head of Strings the following year until 2009 when he returned to a freelance career. He is active as a recitalist and chamber musician performing throughout the UK, Europe and Southern Africa. His duo partners include John Lenehan Richard Ormrod and Peter O' Hagan. He has worked with ensembles include Soundwaves (South Africa) and the PM Ensemble in Cardiff, as well as having much experience as a violinist in both chamber and symphony orchestras. Christopher has given the UK premi�res of the complete works for violin and piano by the Lithuanian composer Juozas Gruodis which are featured on this CD. Since the recording's release, the Lithuanian Music Information and Publishing Centre has commissioned Christopher to prepare a new edition of the Gruodis and Banaitis Sonatas for Violin and Piano which will be released later in 2015. Praised by the New York Times for his "great flair and virtuosity and the London Times "a masterly recital , John Lenehan s performances and recordings have been acclaimed throughout the world. As a soloist he has appeared with leading orchestras at home and abroad. In 2010/11 he made his debut with both the London Symphony Orchestra (at the Barbican) and the Royal Liverpool Philharmonic Orchestra (at Philharmonic Hall) as well as performing with the RPO in the Royal Albert Hall. The recording and presentation are first-rate, and Horner and Lenehan are certainly excellent advocates for the cause. They clearly show a passion for, yet innate sensitivity to the composer�s quite individual style of writing. Gruodis was, in fact, a competent player of both violin and piano, and seems to have applied this knowledge to get the best out of each instrument. In such a partnership where the musical content is so equally shared between the players, pianist, Lenehan, scores just marginally higher in the quality of his technical performance overall than his violin-playing partner, Horner. If you are looking for something new, and decidedly refreshing, and aren�t especially well versed in music from Lithuania, or specifically by Juozas Gruodis, then this charming and interesting addition to the repertoire would make an excellent purchase. No doubt it will lead to some further investigation of the composer�s, and his country�s music. Juozas Gruodis (1884�1948) is one of the most eminent and original Lithuanian composers of the first half of the 20th century. His emergence into the musical life of the time was as a promoter of progressive artistic ideas and as such was resolute in elevating the budding Lithuanian professional music scene to European standards. Gruodis�s musical career spanned almost five decades from the years prior to the declaration of Lithuania�s independence in 1918 to the beginning of the Second Soviet Occupation in 1944. His creative work as a composer began rather late in life due to disadvantaged personal circumstances and frail heath. He nevertheless managed to achieve prominence in diverse musical fields. Gruodis became the first professor of composition in Lithuania and thus laid the foundations for the national school of composers. He was the founder and director of the first conservatoire in the country and was also active as a conductor, public speaker and writer on various musical issues. Born into the family of a poor artisan and amateur musician, Gruodis began his career as an organist, working in remote villages and small towns up until he had turned thirty. After studying the basics of composition theory under his own tutelage, he then went on to study music in Moscow, first taking private lessons in 1914, and finally entering the Moscow Conservatory in the autumn of 1915. However, due to the onset of World War I (Gruodis was conscripted into the Russian army as a military bandmaster) and failing health (he visited Yalta several times to receive treatment for arthritis at the Lithuanian Sanatorium), his studies were consequently rather prolonged but nonetheless completed and he obtained a diploma in 1920. After returning to Lithuania and receiving a state scholarship that same year, Gruodis pursued composition studies at the Leipzig Conservatoire. His professors in various disciplines � Stephan Krehl, Paul Graener, and Sigfrid Karg-Elert � contributed much to the significant enrichment of his musical language and, especially, of his harmonic writing. In the spring of 1924, he passed his finals with distinction and returned to Kaunas where he was appointed second conductor at the State Theatre. After three years in this position, in 1927, he received an offer to replace Juozas Naujalis as Director of the Kaunas State Music School where he shortly afterwards set up the composition course and began teaching all the disciplines within this course. On his sole initiative, the Kaunas State Music School was renamed a conservatoire in 1933. Being granted a professorship in 1936, he resigned from his post as the Director of the Kaunas Conservatory due to declining health and continued teaching as Head of the Composition Department. Until his death in 1948, he educated quite a number of composers who were among the first to receive professional training in Lithuania and earn renown in post-war years. In interwar Lithuania Gruodis became a supreme authority in all music-related matters. His merits were also recognised abroad and he was decorated with both the order of the Crown of Italy (1929) and named Honorary Fellow by the conservatories of Latvia (1930) and Helsinki (1932). After the occupation of Lithuania by the Soviet Union at the end of World War II, the Soviet government officially recognised Gruodis�s contribution to Lithuania�s national culture and even awarded him with the title of the Artist of Merit of the Soviet Republic of Lithuania. However when the odious resolution of the USSR Communist Party Central Committee on Music was issued on February 10, 1948, many modern-minded leading composers of the time were officially accused of �formalism,� starting with the likes of Dmitry Shostakovich, Sergei Prokofiev and Aram Khachaturian. Gruodis�s work as a composer and music educator fell under the harshest criticism in Lithuania. His public �self-condemnation� in the article "Music should come from the people and for the people� was published in the local official newspaper Tiesa on April 16, 1948, causing the composer�s sudden death from a heart attack that same day. Gruodis�s artistic output is quite modest in its quantity, but nevertheless invaluable in its quality and historical significance. He was among the first to compose large-scale works in Lithuanian music, including the ballet Jūratė and Kastytis, three symphonic poems, suites, instrumental sonatas, and a string quartet. However, he was more productive in minor genres, such as pieces for piano and instrumental ensembles, songs for choir and solo voice and arrangements of Lithuanian folk songs. In quite a number of his works, one�s attention is drawn to swift and bracing episodes, throbbing rhythms and the interplay of varied accentuation, along with the density and intensity of sound texture. Even though lyricism and a restrained expression of strong emotion were not alien to his temperament, he was in his true element with dramatic intensity and heroic action. His mature works are distinguished for their perfect balance between emotion and rationality of construction. In terms of style, his music generally falls into the trends of late romanticism but with the addition of significant impressionistic or expressionistic tendencies in some of his late works. The national character of music was one of the primary concerns in Gruodis�s work. He was intent on searching for the sources of music�s distinctive national character in folklore, making an ample and very individual use of its elements from the oldest, archaic examples. He attempted the synthesis of modernity and national character by combining specific elements of Lithuanian folk music (especially the sutartinės � ancient polyphonic songs) and modern expressive means, especially the dissonant harmonies that seemed rather daring at that time. In 1932, Gruodis described the main direction of his work in an aphorism: "By using modern means, I strive to be a Lithuanian national composer.� Within Lithuanian professional music, a combination of national character and modernity has become a goal and tradition for many generations of Gruodis�s pupils and successors right up to the present day. The Sonata for violin and piano in D minor, composed in Leipzig in 1922, is one of Gruodis�s major works and the first ever contribution to this genre by a Lithuanian composer. The predominant mood here is that of a lyrical and sincere unveiling of the heart, which acquires a more agitated or even dramatic tone at certain climaxes, sometimes giving way to moments of impish playfulness. The sonata as a whole is bursting with youthful élan and joy of life. In all four movements the composer employs entire melodies or elements taken from Lithuanian folk songs. The first movement evokes an inspired romantic poem. The principal theme, a sensuous melody in the violin heard after a short piano introduction, sets the tone for the whole movement. The second theme is based on the authentic melody of a lyrical folk song. The slow second movement opens with a theme distinguished by a broad cantilena and dense harmonies, rich in chromatic colours. A restrained expression of deep lyricism relates this theme to the characteristic features of Lithuanian musical folklore. The light and frisky theme of the middle section stands in sharp contrast to the elegiac nature of the outer sections. The simple diatonic structure of this melody also seems to indicate its folkloric origin. The third movement, a scherzo, sizzles with spontaneous rejoicing. Instead of melodic invention, this movement focuses on rhythm. It is volatile, changeable in character and full of unexpected accents. For the finale the composer chose an authentic melody of the sutartinė as its principal theme. This playful theme, recurring between the episodes of a more lyrical character, evolves into a kind of the apotheosis at the end. 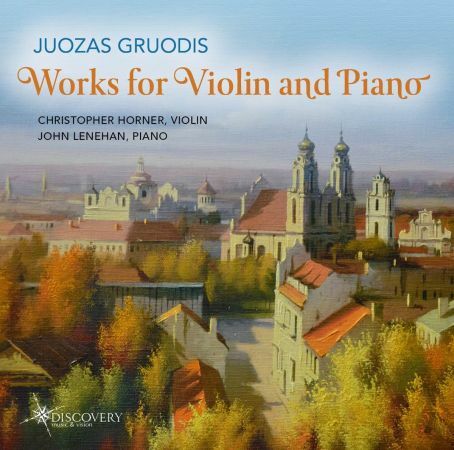 Gruodis was a competent player of both the violin and the piano and seems to have applied his knowledge to reveal the technical and expressive possibilities of both instruments to the most gratifying effect. The Second Piano Sonata in F minor (1921) was composed in Leipzig where Gruodis studied composition at the conservatoire with Professor Stephan Krehl. The requirements of an academic assignment dictated the strict three-movement form and rather uncomplicated musical writing. The music of the first movement is energetic and passionate. Thematic material is clearly divided into two contrasting spheres: the solemn character of the opening theme group is contrasted with the limpid and mellifluous secondary theme. This movement is written in conventional sonata form. The middle movement Adagio is especially noteworthy and is based on the popular Lithuanian folk song Tykiai tykiai Nemunėlis teka (Calmly, calmly the Nemunas river flows), which Gruodis later published as a separate piano piece Lietuvoj (In Lithuania). The third movement resembles a rondo, with its playful, dance-like themes. Texture and timbre in Gruodis�s works were of secondary importance, for him the primary concern was melodic and harmonic invention. Hence it is not surprising that quite a few of his works were written for more than one combination of instruments and can be easily transcribed or arranged for different combinations. This CD Album features seven songs for voice arranged by the performers and woven into a song cycle entitled Joys and Sorrows. In most of his solo songs, Gruodis sought to emphasize the meaning of a poetic text, certain phrases or even separate words. His vocal lines are somewhat contrasting in nature, oscillating between broad cantilena and recitative. Melodic features also derive from harmonies formed within the rather independent piano accompaniment. On the earth, in the sky. I will blossom like a Southernwood (1945, text by Salomėja Nėris) � an allegory of transient life filled with peaceful acquiescence. The cycle includes two arrangements of Lithuanian folk melodies made in 1929 of which the first is I, the Mother-in-law, a humorous song about the conflict between the mother-in-law and her daughter-in-law. Love! (1920, text by Adomas Jak�tas) � an exalted hymn to labour and love. And moves and bends its tail feathers politely. The second of the Lithuanian folk melody arrangements of 1929 is Oh, On A Hill, a folk ballad about the tragic fate of a girl named Ulijona. Gruodis was especially fond of the elegiac melody of the latter song and used it on various occasions. This CD Album concludes with Four Pieces for Violin and Piano which were transcribed for these instruments by the composer from various compositions written in different genres. Oriental Dance (1931) is a piece of incidental music for the play Sabbatai Zewi by the Polish playwright Jerzy Żuławski which is about the life of a Jewish religious and political figure of the 17th century. Gruodis masterfully conveys an air of exoticism surrounding the Ball in the palace of a Turkish sultan. � la Chopin (1921) is the author�s original transcription of Variation No. 6 from his Variations in B-flat major for piano composed during his student years in Leipzig. Both final pieces � Waltz and Song of the Sea � are the composer�s original arrangements for violin and piano of two numbers from his only ballet Jūratė and Kastytis (1933).The ballet was composed after the eponymous romantic ballad by that classic figure of Lithuanian poetry Maironis (born Jonas Mačiulis) about the love and death of the fisherman Kastytis and the sea goddess Jūratė. The two numbers represent scenes from their wedding celebration in the amber palace of Jūratė at the bottom of the Baltic Sea.